Do you want to close the door on your “dirty little secret”? You are not alone; so many people just can’t get organized. It’s not because they are lazy or unable, it is that they simply do not know where to begin. Someone’s home and/or workspace can tell you so much about them. Organizing is a process, not a one day project. These are words to live by or so Amy believes. all the year has brought most of us feel weighed down. can help you take the ouch out of organizing! Don’t let “SUMMER BE A BUMMER”! With the warm weather comes a whole lot of “stuff”. From pool accessories, beach equipment and just your plain day to day items, sometimes it seems as if you need a second home. outside of their homes but neglect the inside. Landscaping isn’t just for the outside of your home anymore; we need to show the same TLC to the inside as well! Amy knows all too well how hard it is to keep up with a busy lifestyle. With family, careers, a social life and trying to find “me time” the last thing on our minds is, “is my home and or office place functional”? The truth of the matter is probably not. Nine out of 10 times we do 5 things at once and 4 of those things suffer. Having a third party like Clutter Bugs assist you while you make your space more functional makes sense. Don’t allow your things to over take your space, because you have the right to control your environment. because they don’t have a home. The key to getting organized is to find the best possible home for all your things. Making your space functional is not always the easiest job. Amy has found a way to help her clients lose the overwhelming feelings and get to work. As a mother of two, Amy knew clutter and had to make organizing a way of life. Inspired by her first child Gabriella, Clutter Bugs LLC was born in 2005. Wanting to do something she loved creating her own business was the way to go. From moving to collecting and just plain old inheriting other people’s things there is just not always enough space. So that’s when cluttering becomes an issue. 1. Have you used this item in the last 12 months? 6. When in doubt throw it out! it doesn’t have one somewhere else. From donating to charitable organizations and selling your items either in second hand shops or having your own sale can really lighten your load, and put a little extra in your pocket. E-mail amyclutterbugs@gmail.com or call 302-438-8137. Are you feeling ashamed? Do you feel like you can’t have people over to your home? Has the anxiety overwhelmed you? 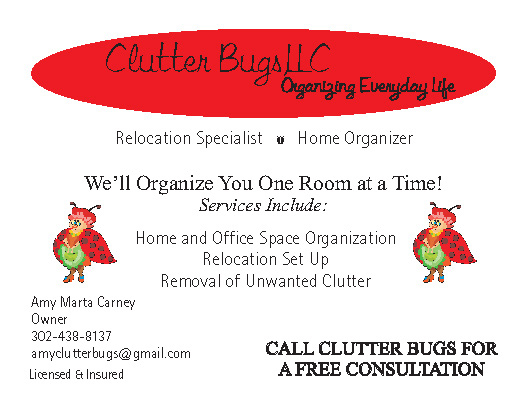 Call Clutter Bugs LLC, don’t wait another day…. They will help you regain control of your life. Next Story → There’s a brand new way to stretch your design budget … and it involves the internet! Making the Most of your Decorating Dollars!